Four-time Oscar-winning filmmakers Joel and Ethan Coen ("No Country for Old Men", "True Grit", "Fargo") write and direct "Hail, Caesar! ", an all-star comedy set during the latter years of Hollywood's Golden Age. 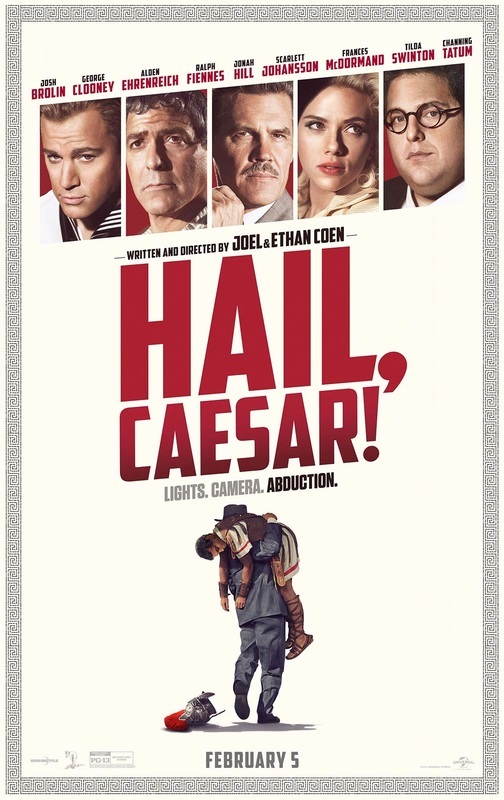 Starring Josh Brolin, George Clooney, Alden Ehrenreich, Ralph Fiennes, Jonah Hill, Scarlett Johansson, Frances McDormand, Tilda Swinton and Channing Tatum, "Hail, Caesar!" follows a single day in the life of a studio fixer who is presented with plenty of problems to fix. "The more 1950s films a person has seen and the greater their love for Hollywood of 60+ years ago, the greater their appreciation will be of what Joel and Ethan have brought to the screen." "A nice trip to the past thanks to the amazing performances, beautiful photography and light humour." "The masters of bone dry irony and quirk line up an all-star cast to pay homage to an era of Hollywood when actors were indeed cattle and movies dripped with glamour and the promise of escape." "Not only is this one of the funniest films of the year, it's an irresistible game of references to classic cinema." "The Coen Brothers' homage to the golden era of film with a spice of their signature direction. The film produces slick humour, dynamic scenery and plenty of starpower."